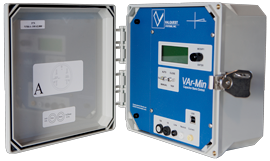 VAr-Min Capacitor Controller | Valquest Systems, Inc.
Valquest Systems, Inc. offers VAr-Min state-of-the-art smart capacitor controls with industry standard meter base connectors for 'plug & play' operation in your smart grid application. These capacitor controls incorporate proven microcontroller technology, on-screen programming and monitoring, plus a USB port for communication to a PC. Communication hardware options include Ethernet, fiber-optic, wireless, radio, cellular, and others, plus software protocols Modbus or DNP 3.0. You can program the VAr-Min through Companion Software (refer to the download to the right), however, programming through the front panel (no PC required) interface is a quick and easy method which covers the majority of switched bank situations. An internal wizard program accepts all necessary information and generates an appropriate algorithm. The software furnished with each capacitor control system is easy to use yet powerful enough to provide detailed information in report or graphical formats. This information can be directed to your computer screen, printed out to a dot matrix or laser printer, or stored in ASCII or standard spreadsheet formats. Real-time voltage, current, watts, VARs, phase angle and power factor are used with your custom programmed capacitor switching algorithm and other variables to control the on/off capacitor bank switching capabilities. Both recording parameters and the report generators can be configured for short-term or long-term data recording modes. Multiple data files are supported for long term historical data analysis. The data analyzed is presented as tabular records or graphical waveforms.